This musical and I go way back. By age five, I could sing every word to "Lovely Ladies" and had deemed Cosette my ultimate idol. Twenty-five years later, Les Miserables (Les Miz for short) holds the same power over me — and I know I'm not alone. Les Miz, based on the book by Victor Hugo, is now in its 32nd year, having played to more than 70 million people in 44 countries and 22 languages. It's the fifth-longest-running Broadway musical of all time. And if the enthusiastic reception at the Marcus Center on opening night is any indication, Boubil and Schonberg's masterpiece continues to keep a strangle hold on Milwaukee-area hearts. Set in 19th century France, Les Miserables is a story of redemption, revolution, unrequited love, and sacrifice — an ode to the human spirit. It's simultaneously tragic, uplifting, and soul-stirring. The central figures are Jean Valjean, the fugitive ex-convict on a journey to become an honest man, and the pious Inspector Javert, who has hunted Valjean for decades in the name of law and duty. Then there's Fantine, a young factory worker forced to turn to prostitution to support her sick child, Cosette — who is eventually taken in and raised by Valjean. 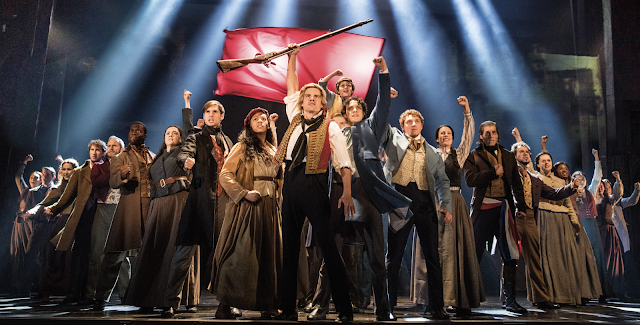 Fast forward 10 years and there's Marius and Enjolras, young men and students on the verge of revolution, and Eponine, a girl from the streets who loves Marius and must watch him fall for the now-grown Cosette. Oh, and don't forget the fan favorites and comic relief, innkeepers and cons Monsieur and Madame Thénardier. It's a lot to digest in a nearly three-hour show, but this superb national touring casts makes every moment worthwhile. 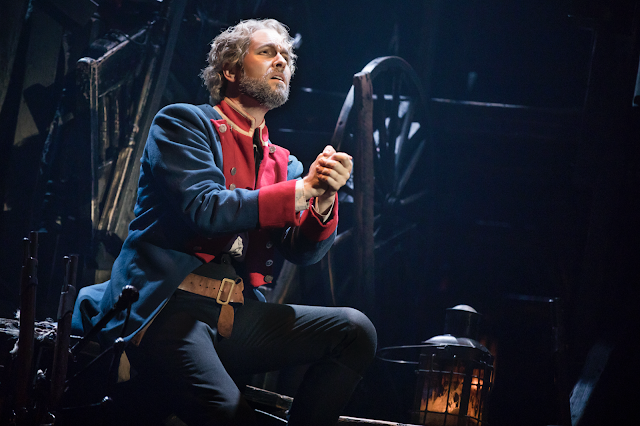 Rather than operatic vocals, Nick Cartell brings a four-octave frontman vibe to Valjean, in the best and most exciting way. In softer moments, his voice entrances, and his rendition of the moving "Bring Him Home" is absolutely exquisite — as good as anything you'd find on Broadway. Fantine, the angel-voiced Mary Kate Moore, gives us a beautiful "I Dreamed A Dream" — her voice big, clear, and effortless. The women of the revolution — a grown-up Cosette and Eponine, played by Jillian Butler and Emily Bautista, respectively — are each incredibly strong. With one a sweet soprano and the other a sky-high belter, these parts can sometimes play out as shrill or try-hard. Butler and Bautista consistently strike the perfect chord. Bringing the laughs, Allison Gunn nails Madame Thénardier, perfectly lacking in any kind of finesse. J Anthony Crane's Monsieur Thénardier, though plenty animated, left me wondering if his talk-singing was intentional or due to illness. If there were time and attention span to heap praise on each and every member of the cast, I would. Alas, let's talk about the gorgeous sets and lighting that brings the world of Les Miz to stunning life. Artful lighting lends all the drama of a Renaissance painting. The freshened set design is based on Victor Hugo's own sketches. Scene transitions from city streets to a factory floor to an ivied courtyard to a towering barricade — it's all seamless and larger than life. But it's the little things in this production of Les Miserables that truly make it a master work; things that are either new additions or simply things one notices upon repeat viewings. For instance, there's such palpable tension between Valjean and Javert (shout out to understudy Steve Czarnecki) just before "Who Am I?" The two fix each other with a nose-to-nose stare, menacing and silent — one of the only moments in the show not backed by the orchestra. It's chilling. Even the supporting characters deliver on nuance. There's the booze-loving revolutionary, Grantaire, and his particular fondness for the little street urchin, Gavroche. Keep an eye on these two during "Drink With Me" and the moments following the fall of Gavroche at the barricade — and keep a Kleenex handy. Better yet, keep a Kleenex handy throughout. There's such richness in the small moments and rapture in the production as a whole, it's easy to be swept away in a tide of emotion. Ugly crying? You bet. Following the resounding and emphatic standing ovation for this touring production of Les Miz, it's a great comfort to know that a show that so speaks to me also speaks to my fellow theatergoers. 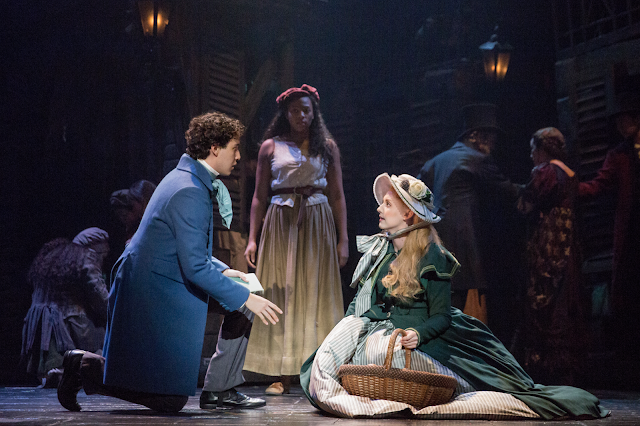 Though she's pushing 33, Les Miserables stands the test of time and trends. Magnificent performances, dazzling sets and staging, soaring orchestrations — these things are as timeless as the show's central message: "Even the darkest night will end, and the sun will rise." 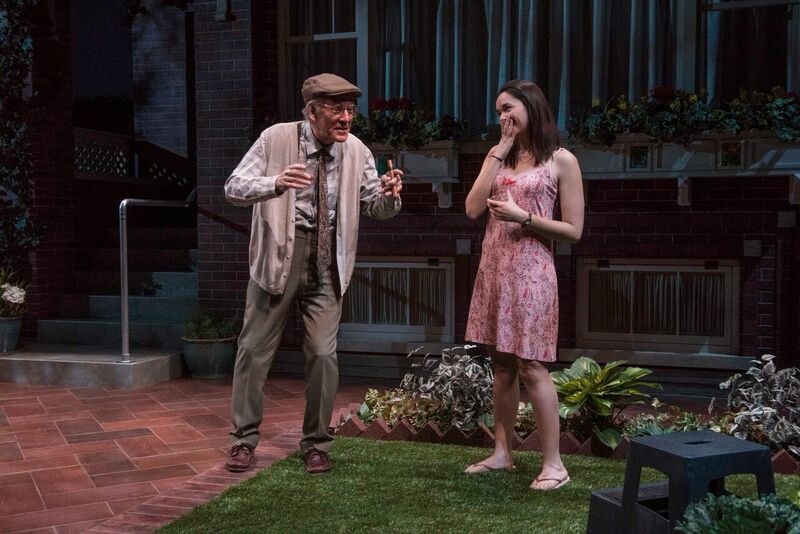 The Milwaukee Rep presents "Always... Patsy Cline"
Welcome to a 1950s kitchen. A collection of retro salt and pepper shakers lines the windowsill, colorful dishes air dry in a rack beside the sink, and a vintage radio lies in wait. 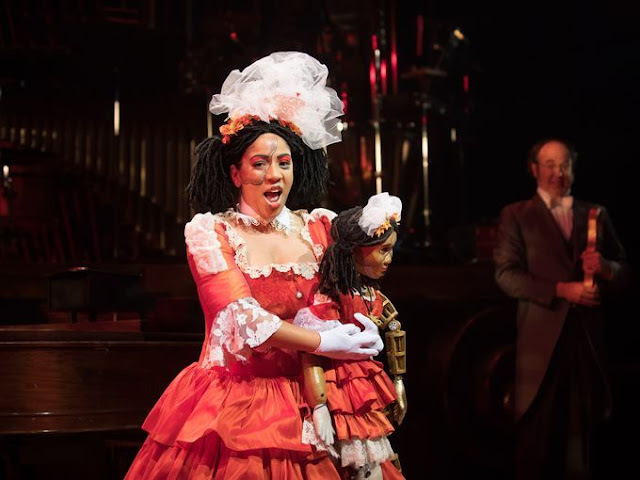 In the corner of the Milwaukee Rep's Stackner Cabaret sits an upright piano, a set of drums, a chair for a bass guitarist, and a mid-century microphone for Ms. Patsy Cline. 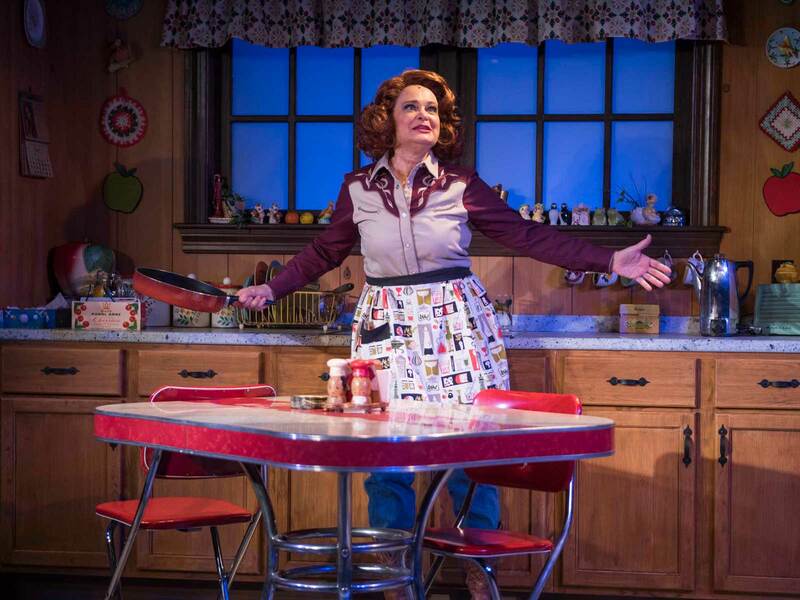 Now, how does Patsy get from that mic at the Grand Ole Opry to a fan's humble kitchen? Ted Swindley's Always... Patsy Cline tells that story — and it's based on a true one. The fan who falls for Patsy in Always... is Houston housewife Louise Seger (ball-of-fire Tami Workentin). She’s the storyteller, taking us from the moment she first heard Patsy on TV to the time she saw her live at the local honky tonk to the night Ms. Cline spent at her house, cracking up in the kitchen until all hours and planting the seeds of a true friendship. As Patsy, Faulkner is a natural. She’s played the role once before at the Rep — back in 2012 to rave reviews and sold-out performances. Six years later, Faulkner steps into the star’s shoes with easy-breezy grace — cool as a cucumber and effortless vocals to boot. There’s warmth and the occasional country cry in her voice. Out of the spotlight, Patsy’s spunky, delightful spirit shines through Faulkner. It’s no wonder she and Louise Seger developed a genuine bond. Workentin is indeed the fangirl in all of us as Louise. In her, we see the moment a voice first stops you dead in your tracks, transports you, and makes you feel alive. An unstoppable, hilarious force, commanding the cabaret stage in her bodacious high-rise jeans and cowboy boots, Workentin is pretty much the quintessential mom you’d find at a favorite concert, groovin' like nobody’s watching. Always... 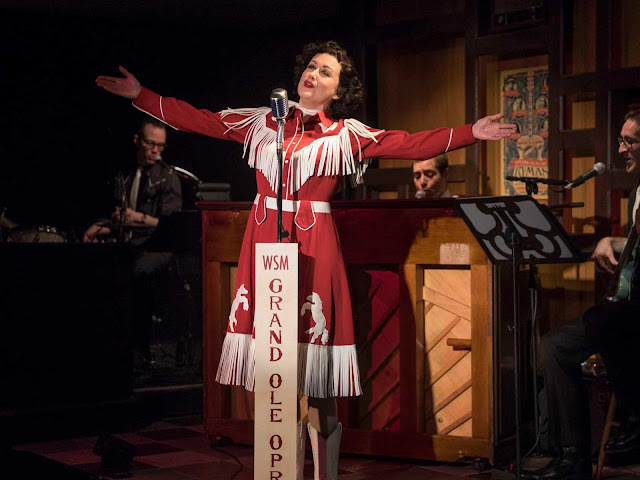 Patsy Cline is playing now through May 20th at the Milwaukee Repertory Theater. Information & tickets at milwaukeerep.com. The Milwaukee Rep presents "Until the Flood"
Ripped from the headlines. Raw emotion. Affecting stories. Diverse perspectives. The kind of stuff that makes you search your soul. 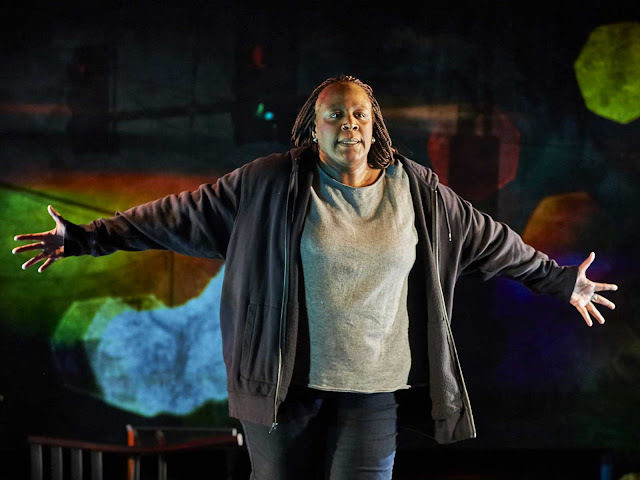 That's what playwright and performer Dael Orlandersmith is bringing to the Stiemke Studio at the Milwaukee Repertory Theater with her one-woman show, Until the Flood. 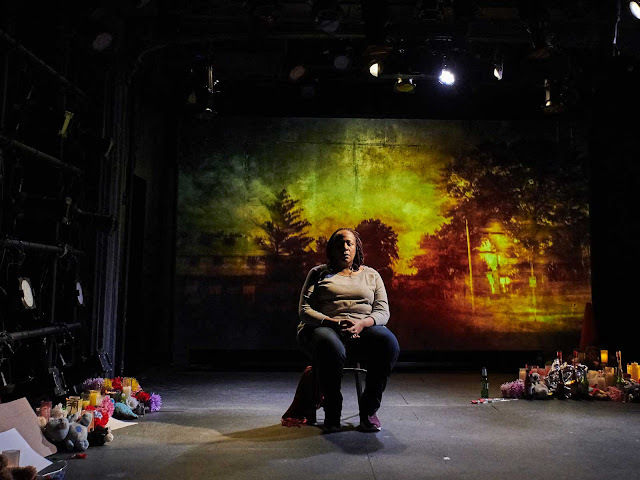 The play explores some of the countless reactions of the St. Louis community to the Michael Brown shooting by Darren Wilson in Ferguson, Missouri. Orlandersmith conducted hundreds of interviews with real folks from every walk of life, then crafted those stories and varied viewpoints into one theatrcal piece. There are eight real-life characters on display in Until the Flood, and each reflects a broad range of life experiences. There's a 70-year-old black woman who attended Michael Brown's funeral. A retired white policeman. A 60-year-old black barber who affirms, "I am not a victim." A white man, late 30s, who speaks on the topic of privilege saying, "No one ever gave me anything." A black minister named Edna, praying for love and peace. A 35-year-old white woman and high school teacher, trying to unpack how each of these young men — the shooter and the victim — got to where they are now. And finally two black young men, age 17 — one hoping to make it out of Ferguson alive, the other asking for death. The juxtaposition of these two boys packs a real punch. One has his parents' support, black friends and white friends, and plans to attend college in California to study Art History. One afternoon, while carrying home a stack of art books, this boy was stopped by a leering, gum-chewing cop who asked him where he got the books — and how could he be sure they weren't stolen? Considering Michael Brown, the boy says: "That coulda been me." Michael Brown was also college-bound. He too, perhaps, almost made it out. 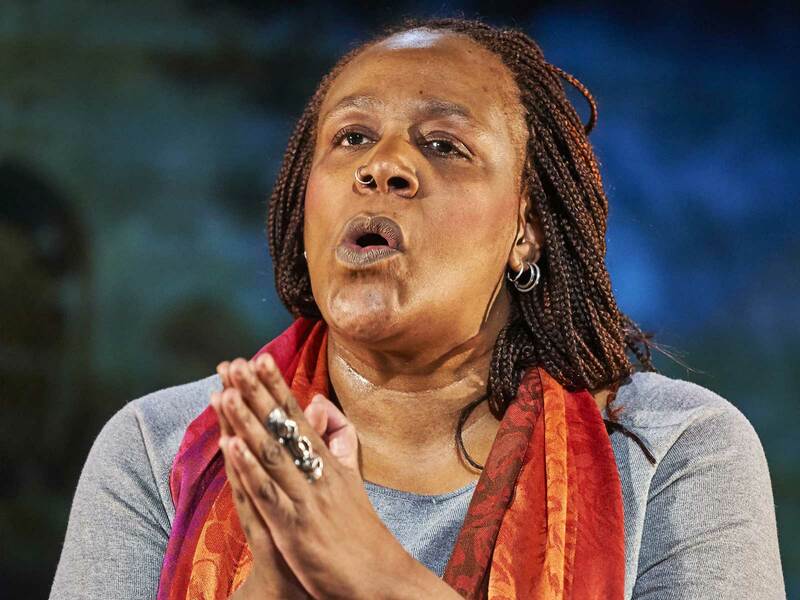 The other 17-year-old boy in Until the Flood gives Orlandersmith her most impassioned and piercing dramatic moments. This boy says he has a kind teacher at school who believes in him — and he wishes that teacher were his own father. Clearly, this boy's home life is either broken or abusive. He talks about cruising with friends — maybe going a little too fast and playing music a little too loudly. He talks about being pulled over by a white policeman, being told to get out of the car, and staring down the cop as if daring him to pull out his gun and shoot. The boy wonders if this is how Michael Brown felt. If "Mike-Mike's" life circumstances and anger boiled up inside him and, in that moment, dared Darren Wilson to shoot. He cries and screams for his own bullet to take him out of this hopeless life. It's tough and true theater; challenging and eye-opening. Some of the perspectives presented are downright horrifying, made all the more so because they come from a flesh-and-blood human. Others offer a glimpse of hope or an attempt to understand the bigger issues that lead to such tragic events as the shooting of Michael Brown. As an audience member, there will undoubtedly be moments that resonate with your own beliefs, as well as moments that make you squirm. Until the Flood is a can't-miss chance to step outside of yourself, consider timely issues, and hear the stories of those folks whose paths you may otherwise never cross. It's a chance to understand where people are coming from and how our own unique situations inform our perspectives and decisions. Any sense of hopelessness stems from somewhere and can, at times, manifest as anger of indifference — just as a hope-filled future can manifest as blind optimism. Following each performance of Until the Flood, there is a short response from a community leader. For my night in the Stiemke Studio, the Rep welcomed the President and CEO of the Boys & Girls Club of Milwaukee, Vincent Lyles. In Lyles' riveting response, he muses that there are many times when we are all good to each other. But what about the times when we're not? "What do we do about the times we're not good to one another?" he asked. While the answer isn't a simple one, Dael Orlandersmith's creation of Until the Flood is one shining example of what to do: Share stories and experiences, educate via art, and — hopefully — bring about some love and understanding in the process. It doesn't get much easier or sinfully delicious than puppy chow. Next to rice krispie treats, this sweet snack is probably one of the simplest ones to throw together. Once these glorious little morsels are done, good luck tearing yourself away. I found lots of recipes online whose ratios of peanut butter to chocolate to powdered sugar vary slightly. Some forego the vanilla — some don't even have butter. Some call for a mere nine cups of Chex cereal, while a standard box is filled with 11 cups. What happened to "no Chex left behind," huh? Oh the humanity! To fix these egregious errors and oversights, I consulted my friend and puppy chow expert, Rachel. She's made puppy chow on a large scale as a camp counselor — even going so far as to make it over an open fire! And she always brings the chow to our up north girls weekends. Thanks to her, I think we've unlocked the ideal ratios for the perfect puppy chow. Come with us on this journey. 1. In a large pot, melt the butter on the stove. Add the peanut butter, vanilla, and chocolate chips, stirring until everything is mixed together and completely smooth. 2. Add the Chex a bit at a time, pausing to mix between each addition and make sure all the cereal pieces are covered in the chocolate & peanut butter mixture. Continue until you've added and coated the entire box. 3. Double-up a couple of brown paper grocery bags. (You could probably get away with just one, but better safe than sorry!) Pour the Chex from the pot into the paper bag, and add 2 cups of powdered sugar. Shake the bag like your life depends on it. Peek inside, and add another 1-2 cups of powdered sugar, continuing to shake like crazy until everything is coated. *Note: I added 4 cups total of powdered sugar, and it was divine. But the choice is yours if you think 3 cups will suffice. I swear, after this post, I can't make puppy chow anymore. It is my drug. It is the sweet I can't I can't say "no" to. Even when I can feel my body saying,"Stop with the sugar already!" there's a reflex that kicks in and just won't quit. So make this recipe if you want to be everyone's favorite. But don't make it unless you want to eat a whole party-sized bowl of puppy chow by yourself. But do make it. You'll probably regret it if you don't. 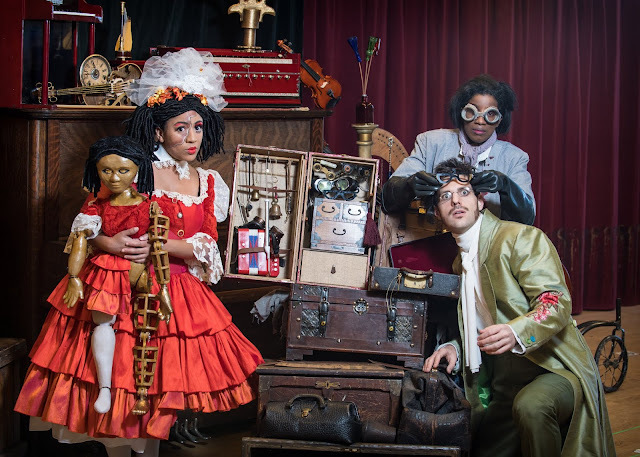 The Skylight & MOT present "The Tales of Hoffmann"
A fresh take on Offenbach's "opera fantastique"
Instrument strings, a violin's curve, a handful of pianos, a gilded harp, a barrage of percussion. 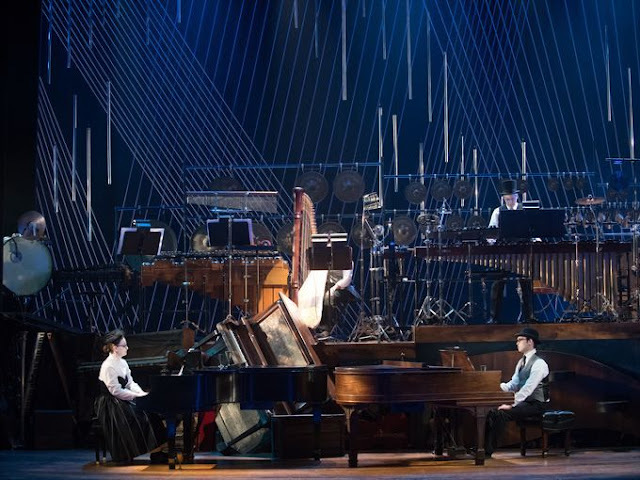 With the scene thus set, the actors and audience find themselves immersed in music even before the first notes are sung at the Cabot Theater for the Skylight's Tales of Hoffmann, a collaboration with the Milwaukee Opera Theatre. The kinetic scene celebrates the inner workings of the art of music-making — just as Hoffmann's tales, though tragic, shed light on the artist's journey from inspiration to creation. The story follows the idea-starved poet, Hoffmann, and his artistic muse along a three-pronged quest for love and vision. In the first chapter, Hoffmann's love interest is a mechanical doll. In the second, it’s a girl who suffers from a rare disease wherein she will die if she sings. The third finds the protagonist enamored with a deceitful courtesan who steals his reflection. Each tale is otherworldly — and each, though playful at times, ends in tragedy. It helps that this Skylight and Milwaukee Opera Theatre (MOT) collaboration is presented in English. It's a brand new translation, unveiled for the first time in Milwaukee. The once sung-through, French opera of over three hours has been distilled into three acts, clocking in at about two hours of stage time. Spoken dialogue breaks up the soaring voices, too, giving the audience some respite from deciphering the lyrics. Yes, even an opera sung in English requires ample concentration. Read the audience guide beforehand. Bringing the Tales to life is a cast of thirteen — eight women and five men, many of them Skylight and MOT veterans. As there are more parts than people, the villain is played by the previous lover in each subsequent tale — a fun opportunity for the sopranos. Truly, the three sopranos — Cecilia Davis, Susan Wiedmeyer, and Ariana Douglas — are each sensational. In particular, the Doll's Song in Act One is like the olympics of arias. Davis masters it with such spellbinding ease, it's an absolute wonder to behold. Then there's Hoffmann himself, played by the brilliant John Kaneklides. Breathtakingly sublime, his tenor voice cuts through all others with its richness and warmth. Plus he's tall, dark, and handsome to boot — the textbook leading man. This is swoon-worthy stuff. Hoffmann's muse, the always-wonderful Diane Lane, lends a dash of humor and jaunty energy to the sometimes over-emotional journey. Lane's presence on stage is a constant delight — and her consistently strong vocals don't hurt either. The overall tone of Hoffmann is rife with broken hearts and a healthy dose of the macabre. With this comes a wondrous, dreamlike quality that the Skylight and MOT have captured exquisitely. The scenery itself, the on-stage orchestra, the celestial lighting, and creative ways in which characters come and go — it all serves to highlight the fantasy in this "opera fantastique." Kudos to Scenic Designer Lisa Anne Schlenker, Lighting Designer Jason Fassl, and Stage Director Jill Anna Ponasik for the surreal and artful staging. In the final scene, a celestial light bathes the stage as Hoffmann reflects upon his series of tragic romances. At one point, the Muse had said, "Love sure knows how to keep us in the dark." Now that darkness is illuminated, getting to the heart of the matter in Offenbach's opera. The Tales of Hoffmann, for all its supernatural qualities, shows that through darkness and confusion, new ideas come into being. The curtain falls with the poet's flame rekindled — his artistic inspiration renewed. Ethereal and uplifting, the Skylight and Milwaukee Opera Theatre have indeed dug deep into the darkness and brought to light something to sigh about. 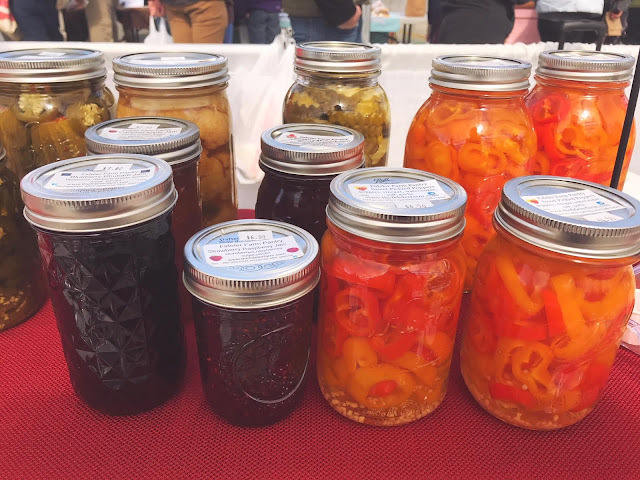 It broke this week that Milwaukee's Winter Farmers Market will be changing locations next season. It's currently held at the Mitchell Park Conservatory (The Domes) in the Greenhouse Annex. It's a lovely, sunny experience, so it's a bummer that things are getting all shook up next winter. But there are still a few weekends left to pop into the greenhouse and bask in all the deliciousness on display. The Winter Farmer's Market runs through April 14th. 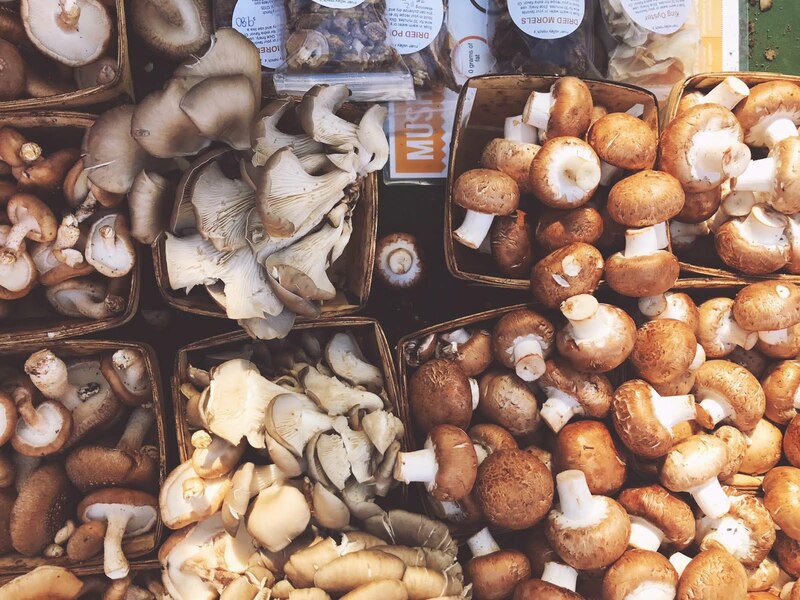 Though there's not a ton of fresh produce (at least, not by noon, which is when I arrived), there's plenty else to tempt your palate and pocketbook. Almost everything is up for a taste test: a dozen or more cheeses, honey, pickles, salsa, hot sauce, and more. I walked away with some cheese and a jar of "Smokin'" sauce for my dad's birthday. There are also some handcrafted goods, like soaps & dog chews. To keep up your strength as you shop, you can sip on Valentine coffee and stop at one of the food stands. I opted for a Press waffle with Nutella, but then spied someone eating a scrumptious-looking noodle soup that gave me slight buyer's remorse. Next time! Because really, it was all too great for there not to be a next time. You could easily spend an hour or more drifting along from booth to booth, sampling as you go and rubbing elbows with local growers and makers. 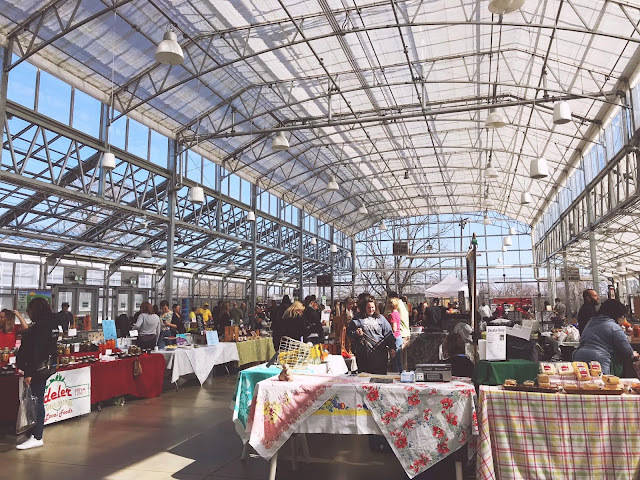 Whether or not you actually buy anything, the Winter Farmers Market a fun experience — one that I'm sure folks will follow to its new home next year, wherever that may be. Prior to last season of the Milwaukee Opera Theatre, with its Magic Flute and Mikado, the closest I’d come to opera fell somewhere between the Phantom and the occasional reference made during reruns of Frasier. Now with a handful of operatic experiences under my belt, I’m particularly jazzed about the Skylight Music Theatre’s collaboration with the Milwaukee Opera Theatre for The Tales of Hoffmann, running March 16–29. Being a relative newcomer to the world of opera, I did some light research. The Tales of Hoffmann was written by Jacques Offenbach — a German-born French composer who penned nearly 100 operettas between the 1850s and 1870s. The protagonist is based on E.T.A. Hoffmann – the Prussian author of such fantasy stories as The Nutcracker and the Mouse King. Offenbach’s original opera was rather tremendous, rendered with a full symphony orchestra, 3+ hours of stage time, a French libretto (text), and a cast of 20 (15 men, 5 women). Rather than attempt to mount Offenbach’s staggering production in its original form, Jill Anna Ponasik, Artistic Director at Milwaukee Opera Theatre (MOT) and Skylight’s Artistic Associate, huddled up with her fellow creatives to make Hoffmann accessible for Milwaukee’s musical- and opera-loving audience. “At MOT, we can’t resist the temptation to look at canonized masterworks from a perspective that’s a little… slantwise,” she says. With the help of translator Danny Brylow, orchestrator Kerry Bieneman, and percussionist Michael “Ding” Lorenz, Ponasik and the MOT crafted a much more intimate adaptation — one that’s sung in English, peppered with spoken dialogue, and accompanied by a nimble on-stage band of two pianos, a harp, and plenty of percussion. The cast now numbers at 13 (8 women, 5 men), and the entire production takes just two hours. “It’s the same music, but a different experience,” Ponasik says. The story follows Hoffmann along a three-pronged quest for love. In the first chapter, his love interest is a mechanical doll. In the second, it’s a girl who will die if she sings (spoiler alert: she really loves to sing). The third finds our protagonist enamored with a deceitful courtesan. Each chapter is a cautionary tale that ends in tragedy. "Beautifully ominous" tragedy, to quote Ponasik. "It's not a tear-jerker, because the stories occur in a world of supernatural fantasy," she says. "Offenbach called it an 'Opera Fantastique.'" I for one can't wait to see what fantastic things await when The Tales of Hoffmann opens this weekend. Hip but humble, bright and spacious, smells of scrumptious smoked meat, coloring crayons for all — welcome to Birch & Butcher. A friend and I stopped in for brunch one Sunday mid-morning and fell a little bit in love with the place. The ambiance is relaxed and classy-cazh. For food, they aim to keep things as local as possible, noting that "the best we have to offer comes from not-so-far-away." With the great things I'd heard about this new-ish spot on Water and Pleasant, I fully expected a long wait — but there was none. Jackpot. 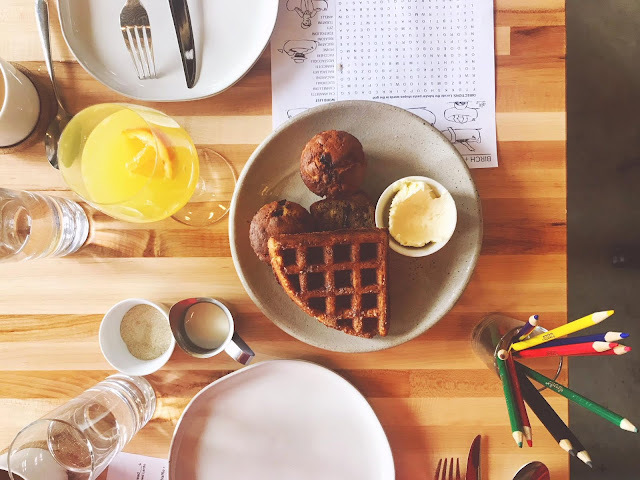 We were seated at a cozy, outward-facing booth and immediately treated to paper menus and a jar full of crayons to keep us busy while we waited for coffee and mimosas. Sit-down brunch is only served on Sundays. All other days, Birch & Butcher offers casual counter service for breakfast and lunch starting at 7:30 in the morning. Daily offerings include the likes of freshly-baked bagels, avocado toast, and breakfast sandwiches. But Sundays are for treating yourself to something more decadent. We started with the Bread Plate of chocolate banana bread, fruit muffins, and waffle wedges. The banana bread and muffins were particular favorites. The waffles don't hold up to Press Waffles, but that's on me; you'd be hard pressed (pun intended) to find me a traditional Belgian waffle that does. The sweet selection is perfectly paired with cultured butter. Always cultured butter. For the main event, we opted for sharesies: Avocado toast and a naan & chorizo dish. The toast requires a knife and fork. It's thick and piled high with avocado, red beets, and herbs — very yummy. 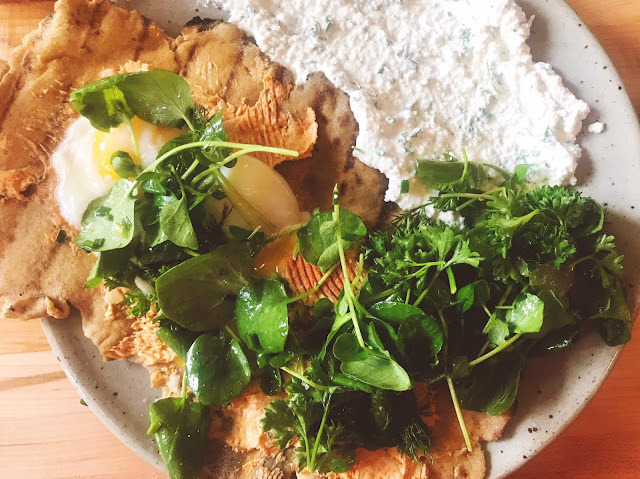 But my favorite was the naan, plated with chorizo, n'duja (a spicy & spreadable pork salumi), poached eggs, ricotta, and greens. Put it all together, and it was so satisfying and flavorful, this is easily one of the best and most unique brunch dishes I've had the pleasure of polishing off. Going back to Birch & Butcher for dinner sometime (and some morning for bagels) is only a matter of time. 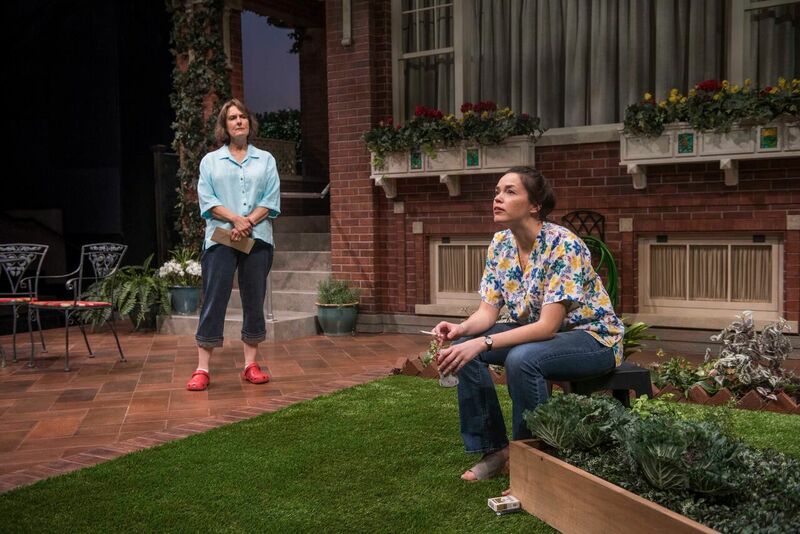 The Milwaukee Rep presents "One House Over"
"Is prying such a bad thing? Shouldn't we be curious about other people's lives? Their hopes and fears and whether or not they like cinnamon crumble coffee cake? That's not prying, that's getting to know someone!" 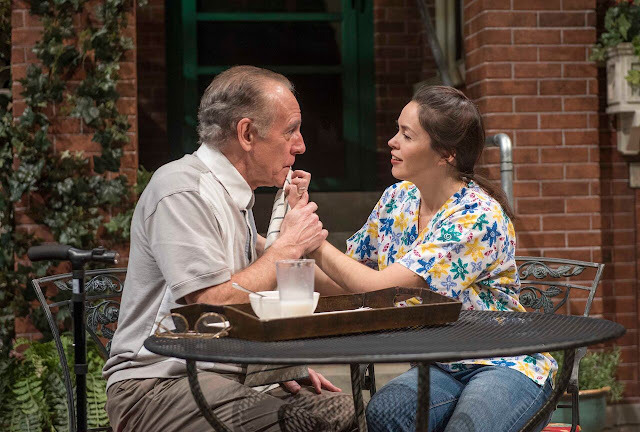 The family whose lives are about to be pried open in playwright Catherine Trieschmann's World Premiere One House Over is that of divorced violin teacher, Joanne, and her aging, ailing father, Milos. He is obstinate to the point of driving his daughter mad. To ease the burden, Joanne (the very convincing Elaine Rivkin) jumps at the chance to hire Camila Hernandez as live-in help, providing constant care for the cantankerous old coot. An 89-year-old Czechoslovakian who fled the Nazis during World War Two, Milos (the outstanding Mark Jacoby) is set firmly in his ways, opinions, and prejudices. At the onset, he's not keen on the Mexican Camila (the fiery Zoë Sophia Garcia), tossing his lunch of black beans on the ground and shouting at the bilingual caregiver, "This is America! Speak English!" But as often happens in stories like this one, it's only a matter of time before the old man's icy exterior starts to melt. These two characters in particular, each an immigrant from a different time and circumstance, open up about their journey to America — the Czech with his "golden ticket" to a job soldering metal in a basement for fifteen cents an hour, the young señora with her ride in the back of a frozen food truck packed with 40 other hopeful souls. Moments like these are beautifully written by Trieschmann. One House Over smartly addresses timely issues with quiet honesty, revealing American immigrants' struggles, hopes, and fears through heartfelt dialogue. There's nothing heavy-handed here — just a couple of people getting to know one another. Jacoby and Garcia play off each other brilliantly, breathing easy life into Trieschmann's very believable characters. The character of Joanne is equally convincing, as is Camila's also-undocumented husband, Rafael (Justin Huen). Joanne has all the hallmarks of a progressively-minded, Chicago-area, Obama-loving, occasional-pot-smoking, middle class white woman — and yet it's surprising where the journey of One House Over takes her. Joanne's evolution is rather sobering in its realism. Her life has been a privileged one, and for all her good intentions, one wonders if she will ever truly see past the end of her nose. On the flip side, a smaller but deeply effective part, played by the remarkable Jeanne Paulsen, is that of Patty, Joanne's stereotypically nosy neighbor. Patty initially appears deeply ignorant, rude, self-serving, and not unlikely to attempt to oust the undocumented Hernandez family. Paulsen plays the part of the witchy neighbor with such glorious disdain, it's fun and illuminating to watch the way in which her character evolves. That's the true beauty in One House Over — the natural way events unfold through a dozen backyard conversations. Though it took a few scenes for this slow and steady play to get its groove, the sense of care and concern for these characters and their complicated lives inevitably sneaks up on you. Plus, the play more than balances the tough and sweetly poignant moments with ample amusement and laughter. Laugh-out-loud funny? The audience on opening night would say so. For me, reactions to the plentiful humor were much less boisterous, though no less felt. Humor is of course subjective, as is one's reaction to the conclusion of One House Over. Trieschmann has committed to honesty and the fact that while some people are capable of change, others simply aren't. It's not hopeless — it's just complicated. It's reality. And it's a conversation-starter. Conversations about fences, boundaries, openness of character, the value of love, health, and freedom, judging a book by its cover, and how anyone could possibly turn down cinnamon crumble coffee cake. 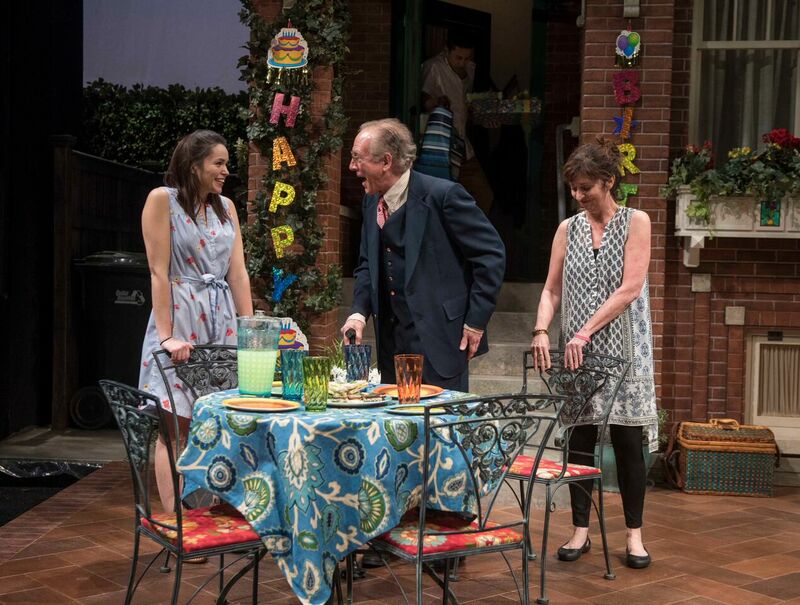 One House Over is playing now through March 25th at the Milwaukee Rep. Information and tickets at milwaukeerep.com. I kept hearing things about Asheville, North Carolina. That the mountain scenery is beautiful, the city's plenty hip but not pretentious, and the food scene's kinda bomb. So when my friend Shea and I hatched a plan to visit her sister Colleen in Durham, our trio (plus Shea's baby Fritz) decided to drive the three hours to Asheville and see what all the hype was about. We Midwestern girls flew in on Thursday morning, arriving about 11:30 eastern time. Stomachs rumbling, we knew we had to stop for lunch on our way out of town. Colleen took us to her favorite neighborhood joint in Durham: Monuts. We wolfed down lattes, tasty sandwiches, and even tastier desserts (because we're on vacation). Try the lemon curd scone and gooey chocolate cookie. Then we hopped in the car and rolled into Asheville with enough time to relax a smidge before scoping out West Asheville and dinner. Our Airbnb truly was a delightful and quintessential West Asheville abode — an small white house with both a front and back porch. The eclectic interior oozed vintage, quirky charm. Plus the place was clean, the shower hot, and the beds comfy. Would stay again. From there, it was just a few-minutes drive to the River Arts District, which is chockfull of galleries and some eateries. If you shoot for The Wedge Brewery, you'll land at a spot chockfull of food trucks and picnic tables — perfect for when the weather's nice. But we wanted margaritas, so we opted for White Duck Taco Shop — a recommendation from a friend and also a place that comes up when you google where to eat in Asheville. 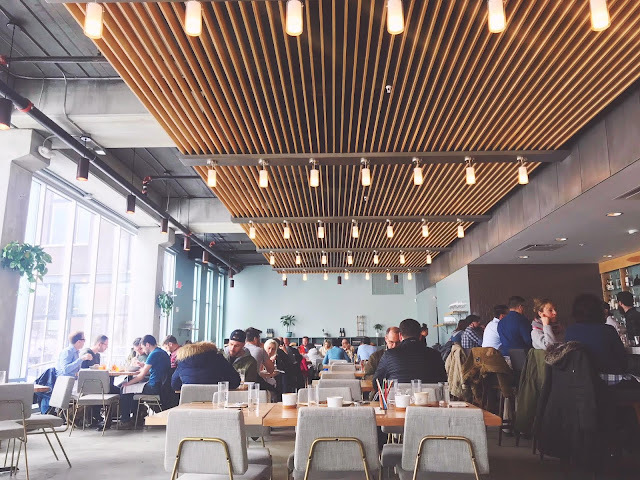 The location in the River Arts District has you order first, then find your table. We picked a spot outside, and thoroughly enjoyed our tacos and queso (though I must say to my Milwaukeeans — Gypsy Taco would win the contest). On Friday morning, we drove 20 minutes to our one main attraction of the weekend: The Biltmore. Notes on visiting: Do buy your tickets online ahead of time, and do print them ahead of time. Otherwise it'll be a pain once you get there (they check tickets as you drive up). So what is The Biltmore? It's the Vanderbilts' estate, complete with a bowling alley and pool in the basement, servants quarters, lavish bedrooms, sprawling gardens, a gorgeous conservatory, a tiny village, a winery, and more. You could easily spend hours upon hours there, especially if the gardens are in bloom. They weren't blooming for us, and we still were there from about 10am to 2pm. Once we got inside the house itself, we chose to spring for the audio guide — a $12 investment that Shea felt was wholly worthwhile. I thought the guide had some fascinating tidbits, but not enough to bowl me over. The guide is 1.5 hours, so do with that info what you will. You'd move faster through the house without it. Then again, I've had past experiences where an audio guide has been worth every precious moment and penny — so you never know until you try! Oh and P.S. We happened to be there during a Titanic movie costume exhibition. I'll never let go, Jack! Carry on. After meandering through the awesome house, we made our way to the gardens and down to the conservatory — where things are always gorgeously in bloom. There were orchids galore on display, and the warm, tropical air felt so very right to this Wisconsinite. I could have spent hours in that place. But free wine called! Yes, admission to the Biltmore includes a free wine tasting in the Biltmore Village winery. The village is a short drive from the house and gardens, and there you'll find a handful of restaurants as well as the winery. The tasting is truly unlimited — so drink the afternoon away! Or do as we did: Cap it off and drive back to downtown Asheville in search of burgers and beer. We ended up at Wicked Weed for lunch. Mainly because Colleen had been there before, was craving a burger, and knew that there was outdoor seating for our perfect 70-degree day. We were plenty satiated. Then it was time to bop around downtown and scope out some vintage clothing stores. Two of our favorites were Ragtime and Honeypot. Honeypot is definitely more weird and funky, and Ragtime is where we actually walked away with some goodies: a slouchy jean jacket, a fur-collared cardigan, and a bubblegum pink Members Only jacket. Downtown Asheville has so many places to shop and eat — each one cuter than the last — it's a bit overwhelming. We could have spent so much more time just bopping in and out of shops. If you're looking for the downtown hub to pop into your GPS, shoot for Pritchard Park. It's a tiny patch of green space smack-dab in the middle of all the downtown action. It would be a good place to start your walking (and shopping/eating) tour of downtown Asheville. Later that night, Shea took baby Fritz home for some real sleep, and Colleen and I explored a smattering of bars. We walked through downtown to Wicked Weed's Funkatorium, but there was hardly anyone there, so we scratched that plan. Instead we walked a few paces and ended up at Twin Leaf Brewery, which had live music and more energy at the time. Asheville has about a zillion breweries — one on every corner, it feels like — so finding a watering hole is easy. Colleen and I then trekked back to West Asheville to a dive bar that her friend had recommended. Our Uber driver, Lorraine, had us in stitches, telling us about the wonderful world of $9 TV antennas in lieu of spending almost $300/month on cable. "Best thing I ever did," Lorraine said. We soon parked at The Double Crown. "My handy dandy handicap!" chirped Lorraine, brandishing her handicapped card and plopping it on the dash before dropping us off. Inside, the place was a glow-y, kitschy, funky delight. Would absolutely recommend. In the morning, we set off for a Blue Ridge hike. We learned that all good hikes seem to start at least 30–60 minutes from Asheville. We opted for the Black Balsam Knob trail — but not before stopping for coffee and house-made energy treats at Ultra Coffeebar in the River Arts District. Note: Their coffee syrups are all made in house! Winding through the mountain roads to get to the Black Balsam trailhead, baby Fritz got a little fussy, and the occasional pitch black tunnel got a little frightening when Colleen's car lights refused to turn on (deep breaths, y'all). But we eventually made it, Fritz eventually stopped his well-earned fussing, and we eventually found the trailhead — and chose the path marked "difficult." A few practical notes: Remember to bring water and snacks, and wear layers. We were a bit cocky with the nice weather in Asheville and didn't layer up quite as well as we should have. Duh, the temp is going to drop in the mountains. Also note that the difficult Black Balsam Knob trail is not a loop. So while hiking and feeling as though you could go on forever in all this beauty, don't forget you've got to walk all the way back, too. Finally, "difficult" is a relative term, as Shea did the whole thing with a baby on her back. Bless. The scenery is utterly incredible — rather rocky and barren on the first half of the hike, then increasingly lush. We could have gone on for ages, but instead opted for a snack break and turning around to head back to the parking lot and the promise of a hearty lunch, which we found at The West Asheville Lounge and Kitchen (AKA The Walk). This place struck the perfect note: a spacious room with garage-style doors opened wide, happenin' but not crowded, energetic but not overwhelming. Oh, and super scrumptious food. Not a terribly unique menu (I had a BLT with turkey & avo), but top-notch for what it was. I wish we'd had more time to spend in West Asheville. This part of town has a long stretch of shops, bars, and restaurants that we didn't have much chance to peek into. There are also eye-popping murals everywhere you look. It's just a fun, funky vibe, while downtown offers more arty-but-polished charm. Both areas are a must. Between lunch and dinner, we stopped at a wild little trunk show by The Booth Fairy, at which Colleen snagged a cute top for just $6. I, on the other hand, simply snagged a bunch of photos of the pop-up's fun hand-painted signage. Giving me life. When we inevitably got hungry again, we ended up back downtown for dinner at Blue Dream Curry — a recommendation from my brother and his girlfriend, and one of our Uber drivers, and Yelp, and the list goes on. It's located right in the heart of downtown, so there's plenty to see and do while killing time waiting for a table. And oh yes, it's worth the hype. The curry itself is truly so creamy, dreamy delicious, I will forever be nostalgic for it. But remember to add your choice of meat when you order, otherwise it comes vegetarian (oops). We feasted on the masala, panang, and yellow curries — masala and panang for the win! Because all we do is eat, the next morning — our last morning in Asheville — we woke up in search of a yummy breakfast. We chose a place in West Asheville that The Booth Fairy gal recommended: Biscuit Head. It was just what the doctor ordered, if doctors prescribed medicinal carbs. Literally everything is served on or with a biscuit, and there are spreads, jams, and butters galore for your shmearing pleasure. We arrived just in the knick of time (about 9:15), as the line was out the door by the time we sat down. But the restaurant moves along like clockwork: Stand in line, order food, find an open table, eat, be on your way. There are always open tables because there's a no-table-saving policy until you've placed your order. It may seem impossible, but it's true — it just works! Wish there were more eateries with this kind of set up. Bellies full of biscuits, we started the three-hour journey back to Durham and the airport. What a delightful, whirlwind weekend. I feel like I can't wait to go back — though I also feel like Asheville lit a fire in me to see more of our stateside towns and cities. The bucket list is growing. Where to next?